Rain in the garden—and in the wildlands—is waking slumbering plants. They promptly show signs of growing and leafing out. Seeds that had been lying dormant in the soil now are sprouting and sending up their tender cotyledons. The garden is beckoning and I can’t resist. I have a long indoor to-do list, but I am drawn to the garden instead. So I take a stroll outside, breathing the smell of rain and earth, looking for signs of the changing seasons. I notice emerging buds on the mostly bare golden currant branches, some dry branches on the otherwise already greened up sagebrush, and the occasional grass that reminds me of weeding and begs for my attention. It’s an hour—or two or three—later before I return to the house for my to-do list. I have a bite to eat instead and continue with my garden obsession. I see signs of fall; the leaves of our native grape 'Roger’s Red' are turning crimson red and adorn our shed and side of our house spectacularly. Some fallen grape leaves crowd the newly emerging common phacelia sprouts, with leaves so delicate and dainty, announcing spring—in December! Winter dormancy is rare but not unheard of among our native plants. I have questions about the milkweed, all signs of it above ground are totally gone and I don’t know if it is dormant or if it died. I haven’t had any luck with growing milkweed so far, but I hope for some signs of life later in spring and continue looking for things to do in the garden. 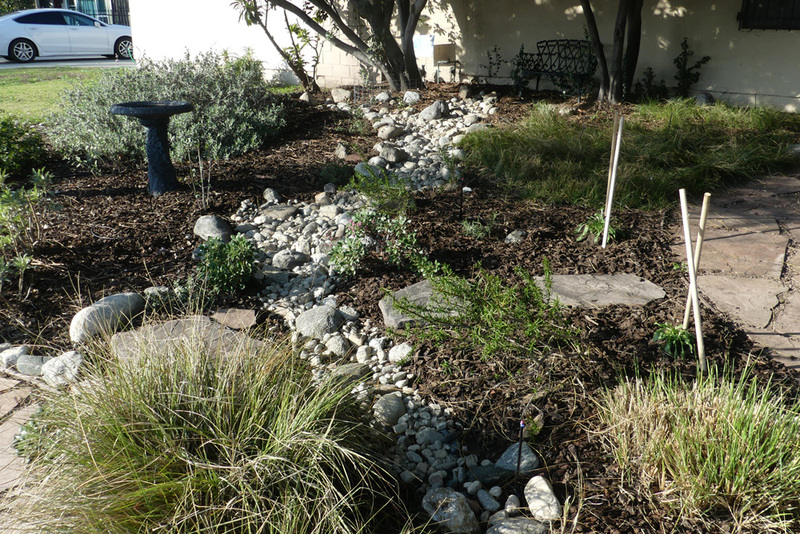 And then I have an idea; I want to build a dry creek bed that may function as a swale in our front yard. My husband and I discuss the idea, consult our garden books, and check online for do-it-yourself tips. I get excited about finding a worthy project that can keep me from attacking that infamous to-do list, which incidentally is getting longer and longer. So I get to work and decide the path of the “creek”, winding from the toyon near the house, past the sedges and between the wooly blue-curls and buckwheat, crossing the short stepping stone path, and petering out among the deer grass. The digging of the trench is not much of a chore. A lot of mulch collected naturally below the evergreen toyon and holly-leafed cherry. Underneath the mulch, the soil remained soft after our recent rainfall. A week later, I start placing a few large rocks along and in the creek bed. Luckily, I find rocks that are already in our yard, I just need to move them to their new location. Designing the rock assembly in the garden is fun, like designing an indoor furniture layout. It takes time, and I try out different positions of those heavy rocks. At the end of the day, I feel the heavy lifting in my back. It takes another three weeks to complete the purchase and collection of the medium-sized rocks and their placement. Fortunately, my husband and even my two young grandkids help me with this task. Little hands carry rocks, one or two at a time, drop them in the “creek” and scramble back to the rock pile in our SUV trunk. I cherish this moment—our grandkids working with us and creating this natural habitat in our yard. This creek bed can last for decades, and every time I look at it I feel the joy that I felt watching the kids helping us. When they visit, I am sure they’ll remember too, playing in the creek bed and climbing the toyon, whose low branches make it ideal to climb up into it. They love Grandma’s garden playground, where they have pretty free rein—except for stepping on plants! The last load of rocks and sand for the finishing touches have to wait for still another weekend, when no kids are around. But now, I feel a great sense of accomplishment, enjoying the fruit of our labor, and waiting for the next rain to test our creek bed and swale. Will the water really flow in it and collect before slowly percolating into the ground? I’ll tell you in the next Paintbrush. PS: I just read an article online at BBC Capital about a research study that indicates that the hobby of gardening appears to prolong your life. So get out and tend your garden, sow wildflower seeds and plant your new plants. You might live longer and the earth will reward you.